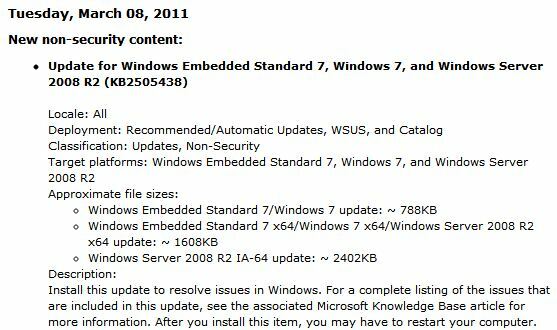 Given that an update was pushed out of band in mid-February to pave the way for changes to Windows Update prior to the release of Windows 7 and Server 2008 R2 SP1, and that I believe Windows Update repairs are needed after SP1 is applied, I can only speculate that this update will probably address whatever issues the Windows Update Troubleshooter found following SP1 install on all of my machines. (See my blog on post-SP1 repairs needed for more info on what I observed.) Alas, the KB referenced in the preceding screen cap is not yet live on the MS Web site (KB2505438). And of course, Patch Tuesday being what it is — a way for Microsoft to batch up its security updates, and for IT admins everywhere to plan to deal with them on a regular schedule — there’s also some other action in the offing for Tuesday, March 8 as well. There will be three security updates released that day as well, all of which will address remote code execution vulnerabilities. Two of these are rated Important, and one Criticial. One from each of those categories will address Microsoft Windows vulnerabilities the third (important-rated) item addresses vulnerabilities in Microsoft Office. But compared to the dozen or more security updates released in February, this makes March a light month by comparison.